The budget padding controversy took a different turn on Tuesday as the Presidency denied knowledge of any padding in the budget presented to the President for his ascent. Senior Special Assistant to the President on National Assembly Matters (Senate), Senator Ita Enang, and his counterpart in the House of Representatives, Hon. Ismail Kawu, told newsmen in Abuja that the budget signed by the President which is being implemented was not a padded budget. 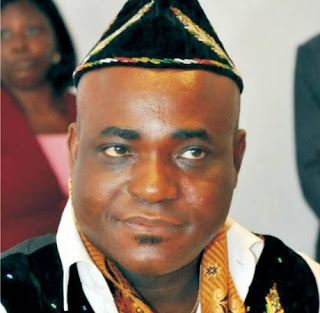 Senator Enang who spoke after over three hours meeting with the national leadership of the All Progressives Congress (APC) said in legislative palace, there was nothing like budget padding, pointing out that when the a budget is presented to the National Assembly, it is expected that they deliberate and pass it as they deem fit. The former Chairman of the House committee on Appropriation, Abdulmumini Jubrin, had accused Speaker Yakubu Dogara, his deputy and two other principal officers of being the brain behind the budget padding. However, while the controversy rages on, a group lawmakers which identified itself as Transparency Group had accused the executive arm of government of not free from the blame either on the issue. Enang however, refused to give details of their meeting with the APC leadership, pointing out that they have all been asked not to make further public comment on the issue as the party was handling it as a family affair. He said: “I am here on the invitation of the leadership of the APC with my colleague to bring answers to issues raised by the party on the 2016 Appropriation and we have been with the party for a little over three hours. We have given explanations to them on every issue and told them that there was nothing, to our knowledge, like padding of the budget. “The budget as assented to by Mr. President is the budget as passed by the National Assembly and that is the budget being executed. “But as of now, the party is handling it as a domestic issue, and all of us are enjoined not to make public comment on the details because the matter is still under consideration. Asked whether the Presidency was giving the Leadership of the House of Representatives a clean bill over the issue, he said “I will want to say that we came here as persons who works as liaison officers on the budget because the party had questions for us and we came to make clarifications on the issues raised. “We have made those clarifications and would not want to draw any conclusion. Please let us not go too far by mentioning any office. Let it be that the two of us appeared before the party.